Penang is a real hidden gem! I loved it! Listed as a UNESCO’s world heritage site since 2008, Georgetown is famed for its diverse cultural heritage and has by far the most charming murals in Asia! In my opinion, one of the best ways to enjoy Penang’s capital city is to hunt out all the famous murals and installations. Walk around the streets (Chulia Street and Love Lane are the main ones), get lost among antique colonial buildings, and enjoy taking a lot of pictures! 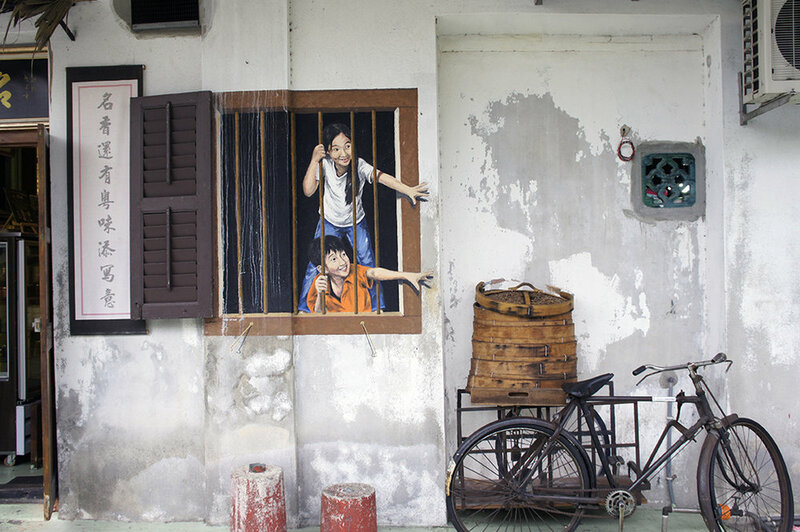 The most famous artist is Ernest Zacharevic and his works have a 3D appearance because he incorporates real objects to his murals, creating unusual, lively, and engaging vibes. I did a sort of treasure hunt to find them all! :) Have a look! The café trend is a worldwide phenomenon with no signs of slowing down and in Georgetown you can definitely find great spots! These trendy cafes have quirky interior design, mix of styles and a nice atmosphere. Find out my favorite cafes and Malay food clicking here! Other museum in Georgetown are: 3D Museum, Penang State Art Gallery, The Camera Museum and Chocolate & Coffee Museum. There's no time to get bored! !